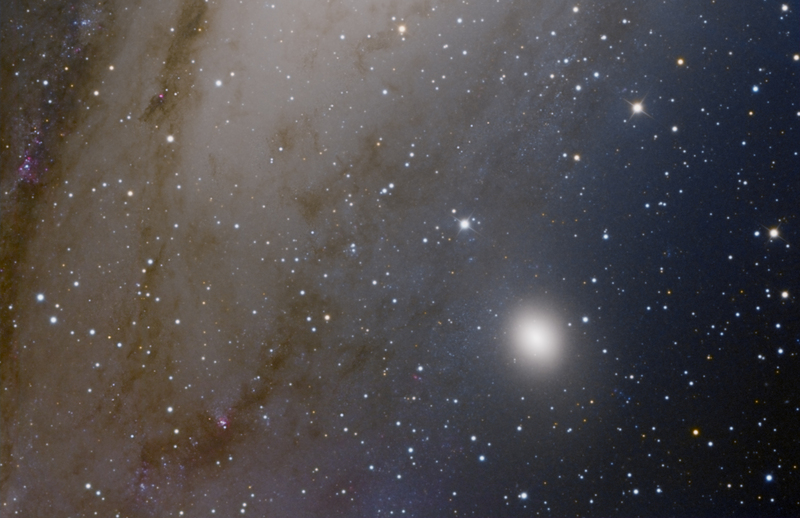 This image shows the Dwarf elliptical galaxy M32 (aka NGC221) along with some details of M31, the Andromeda galaxy. While this is a LRGB image, some of the Ha regions can be seen. Several of the globular clusters around M31 are visible in this image (a future exercise will be to identify them and upload a second image showing where they are). As planned, I did get some Ha (about 2.5 hrs) data and have included this in a revised image of this object. The Ha did really bring out the nebulosity in several areas. The updated image can be found at this link. M32 is about 6500 light years across and likely has a super massive black hole in its center (1.5-5 million solar masses). It consists mostly of mature red and yellow stars. This galaxy is the smallest Messier object and its structure is likely the results of interactions with the much larger M31; portions of which can be seen in this image. Used with permission, No reproduction of these images are permitted without written approval from Smoot.